School transportation planning is a tough job! We at Gecko know. You need a bus routing software company that respects this and isn’t trying to tell you how to run your department. That's what makes Gecko different, we listen to our customers. We have been very successful for the past 23 years selling transportation and routing software and student conduct software. View our Online Commercial, Flash Required. GIS Routing is a full function routing, mapping and boundary analysis software product for schools to manage their transportation of students with ease. Student Conduct allows your district to host a web page that allows the Transportation Department to log in and submit student discipline reports electronically. Managing field trips can be a nightmare! The popular T.O.M. 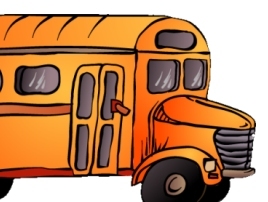 Field Trips is loaded with features that will help bring field trips under control! "We have been using T.O.M. since 1998 and we live and die by it! From billing to automatically assigning drivers to trips T.O.M. does it all. Some months we do as much as 200 trips and it?s no problem with T.O.M." T.O.M. Field Trips has been updated to have automatic email feature work with Gmail. Gecko MS Helps Mercury Mine Kids Map desert area. In May of 2004, Gecko Microsolutions, Inc. helped Phoenix based Mercury Mine Elementary School after school club ‘The Desert Dudes’ create a computer GIS Map of the school’s Desert Area. Gecko and the Desert Dudes brought some hi-tech to the Desert Area by creating a computerized map of it. Using a combination of cutting edge mapping tools like aerial photos and G.I.S. software and traditional mapping tools like benchmarks and tape measures Gecko showed ‘the Dudes’ how to create a highly accurate map of their Desert Area. While making this map the Desert Dudes learned about mapping, measuring and geography!